The Handbook of Equine Radiography is a practical and accessible “how-to” guide to obtaining high-quality radiographs of the horse. It covers all aspects of taking radiographs of the commonly examined regions (lower limbs and skull) as well as less frequently examined areas (upper limbs, trunk). 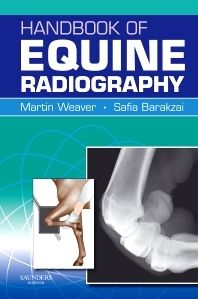 The main part of the book consists of diagrams to illustrate the positioning of the horse and the radiography equipment. For each view a benchmark example of a normal radiograph is illustrated. The accompanying text for each radiographic view succinctly presents the most relevant aspects. Practically orientated, and including chapters covering such key areas as radiation safety in equine radiography and patient preparation, plus a trouble-shooting section, the Handbook of Equine Radiography is an indispensable guide to practitioners in all countries engaged in equine work.